Congress Drives is able to handle a variety of alloys, with 14 cells for both hot and cold chamber die casting. Cold-chamber aluminum die casting – 400 ton to 750 ton. Hot-chamber zinc die casting – 275 ton to 600 ton. 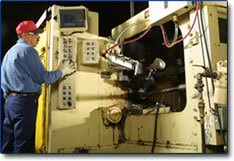 We also maintain a tool and die shop for maintenance and repair of customer dies.